Deontay Wilder versus Tyson Fury master scorecard. Lineal heavyweight champion Tyson Fury 27-0-1 (19) survived two late knockdowns to hold on for a split draw against WBC heavyweight champion Deontay Wilder 40-0-1 (39) at the Staples Center in Los Angeles, California on Saturday night. The 6-foot-9 Brit outboxed the American titleholder for much of the early rounds and appeared on track to outpoint the ‘Bronze Bomber’ on the judges’ scorecards. But disaster struck in the ninth round with a combination of punches culminating in a chopping right hand sent the ‘Gypsy King’ to the canvas. Wilder went in for the kill but try as he might, he was unable to finish the fight. Fury, 30, regained control of the fight to win the next two rounds on all three judges’ scorecards and appeared on the verge of an unlikely victory going in to the twelfth. Midway through the final round the 33-year-old Wilder struck again. A right cross, left hook did the damage and this time Fury went down heavily, appearing to hit the back of his head on the canvas as he hit the deck. So brutal was the knockdown – and with Fury lying dead still on the canvas – Wilder raised his arms triumphantly in the belief that the fight was over. In the greatest comeback since Lazarus, the clearly hurt Fury somehow made it to his feet much to the disbelief of Wilder. Remarkably Fury didn’t just survive the remaining minute-and-a-half, he rallied back to the roar of the appreciative crowd. 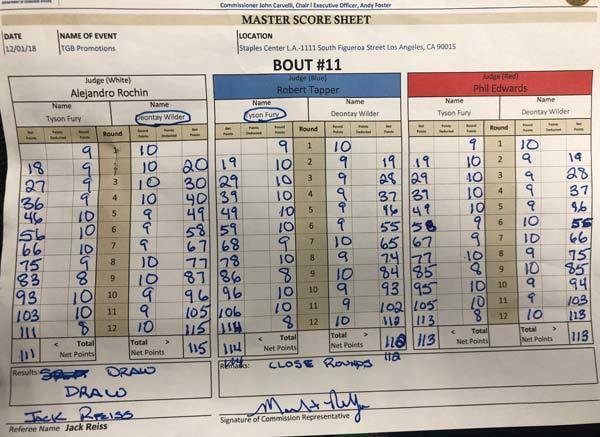 When the dust had settled the scorecards were read out: 115-111 for Wilder, 114-112 for Fury and 113-113 even. The result was a split draw. Wilder insisted he won the fight, even if he was critical of his own performance. “With the two knockdowns I definitely won. I don’t think he had control,” said the 6-foot-7 puncher from Alabama. “I wasn’t hurt. I did not sit still, I was too hesitant, I started overthrowing the right hand. I was forcing my punches too much. Fury claimed he was never hurt in the fight despite the savage nature of the second knockdown. “I’m a fighting man and Jesus has his control over me so I was never going to get knocked out,” said the Mancunian. “I came here tonight and fought my heart out. That is the second best heavyweight apart from me. We are both going home to our family safe. Fury initially demurred when asked about a rematch before finally agreeing it needs to take place. IBF, WBA and WBO heavyweight champion Anthony Joshua 22-0 (21) is due to return to the ring at Wembley Stadium in London in April against an opponent to be named. It will take a special performance to upstage the heavyweight title fight we saw tonight.